A very wet Day 6…and our Contests! What a difference a day can make. Last night the torrential rains rolled in…and it just kept on raining all day! We got to Enaleni…and there were only about 6 kids there. 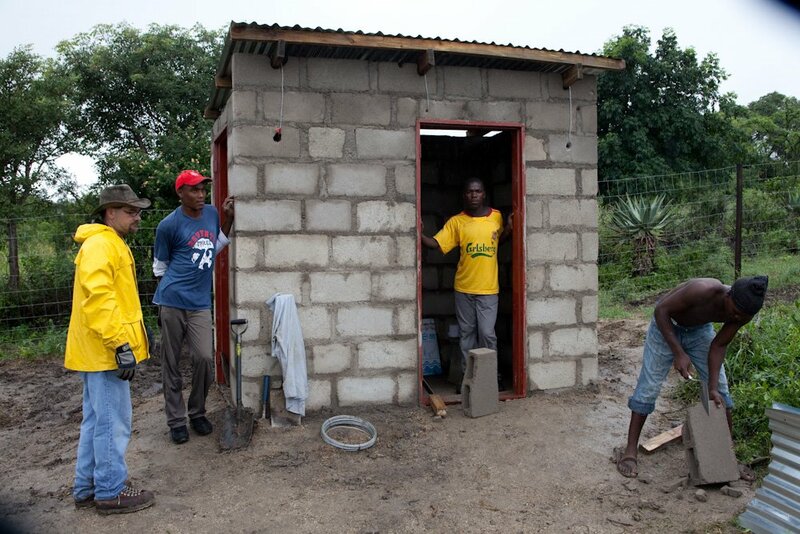 We started working on the garden in the rain…and finished putting the roof on the latrine. By noon…we were all soaked to the underwear! At 12:30 we left for lunch…which was also in the rain outside a small convenience store on the highway…then we went to Bhobhokazi for the first time. Bhobhokazi is an un-fenced, nondescript CarePoint on the side of a road with a decrepit old kitchen that is still used to cook lunch for the kids. When we got to Bhobhokazi there were no kids in sight…only cows and chickens and the Go-Gos getting ready with some food for the kids. Slowly, the kids began to trickle in to the CarePoint…so our team played with them in the rain while a few of us talked with the Go-Gos and D-Team…and prayed with them. By the time we handed out the care-packages there were about 20 kids…stuffed in a little room…feet smushing in the the goat-poop (Sherise says: “A.k.a. Pooze”) from the goats that had been chased out. Bhobhokazi is so undeveloped and needy. The rain certainly messed up our day…but it didn’t dampen our teams enthusiasm or effectiveness. After a brief stop at the downtown market…we got a hot shower and a great supper…and we’re just about to sit down for our last team meeting on Swazi soil. Thanks again for all the prayers…support…and blog comments. Be sure to enter our BIG CONTEST …which is EXPANDING with this blog entry. First, take a look at the giraffe and elephant from the previous entry…read the rules and log on to play! Then…try to guess which team member is holding scorpion (in the last picture of today’s blog entry)…we dug up in the garden this morning. All right answers will be put in a hat and ONE DRAWN by the Mighty Scorpion Handler at each of this weekend’s services. What a day today! It has been raining all day, but that can’t stop us!!!! 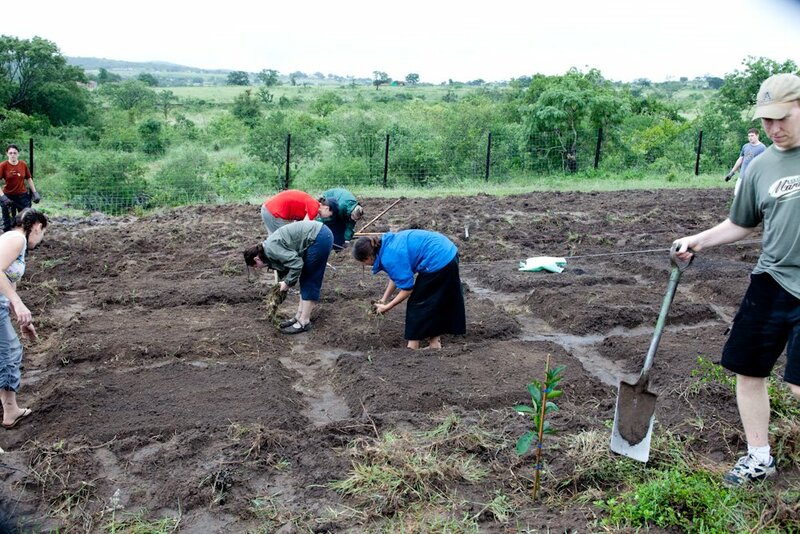 Our team faithfully dug, weeded and planted in the garden and led VBS at Mrs. Langa’s preschool. Today we went to Riverwood’s new carepoint, Bhobhokazi. I didn’t really know what to expect when we got there. I knew that Bhobhokazi was not as developed as Enaleni and that it was needy, but I did not expect to see what I did! Bhobhokazi consists of a mud hut for cooking and a small, unfinished cement building. It does not have a play area for the children and has no sort of protection or security (fence). 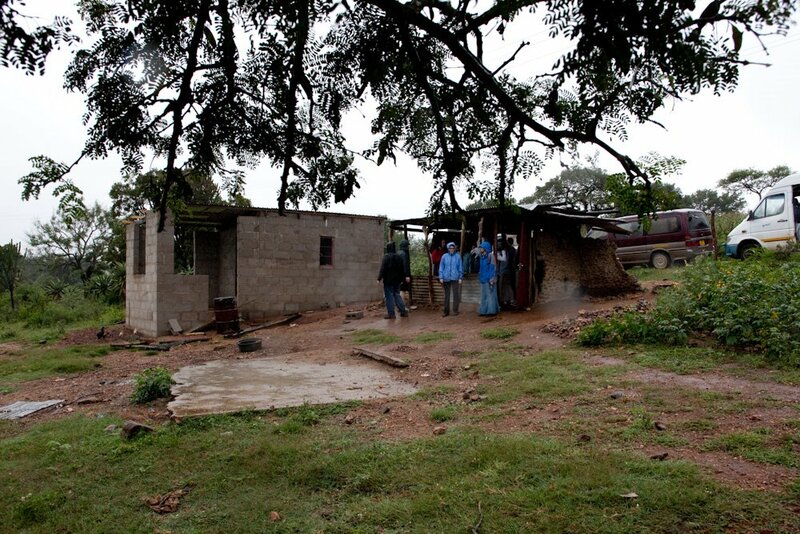 It was clear that Bhobhokazi is a very poor carepoint and needs great support. Because of the rain, there were no children at the carepoint, but, despite this, the Gogo was faithful and still came to prepare food. At first, we just looked at the area and talked to the Gogo; there wasn’t much else to do. We had prepared care packages for the children, but there were none there! However, soon after we arrived, children began flocking to the care point. They walked up to us and were very shy but within seconds they were smiling, talking and hugging us. It was so evident these children wanted and needed so much love and attention. It was so special to be able to give that to these children, even though it was only for a few short minutes. At one point, this little girl ran up to me and began hugging me and smiling at me. It was a beautiful moment. It amazes me how the “small things” have such a huge impact!!!! Then right before we left we were able to distribute the care packages to these kids. The joy I could see on their faces was priceless. Once again, the small things make a huge difference. After meeting some of the children at Bhobhokazi and the Gogo who looks after them, I couldn’t help but feel excitement for our future with this carepoint. It is amazing that a church in Winnipeg, Canada has the opportunity to significantly impact the lives not only in one community in Swaziland, Africa but two!!!! I cannot wait to see what the future holds!!! Today we went to Bhobhokazi! When we arrived, it was raining and there were no kids at the carepoint. It was slightly disappointing to say the least. But we said hi to the gogo and, in a few minutes, group-by-group, kids started showing up. It was difficult to “break the ice” and engage with the kids. Who knew playing TAG was the perfect choice?! Once the game took off, the little Swazi hands didn’t let go of ours. The connection with those kids happened instantly and will just grow stronger! Today was a tough day for me. For those of you who know me well, I hate to be soaking out in the rain. Easy to say, I was a little grumpy inside today, so I wasn’t looking forward to going to Bhobhokazi and “starting all over”. It was very humbling to see the difference in the two care points. 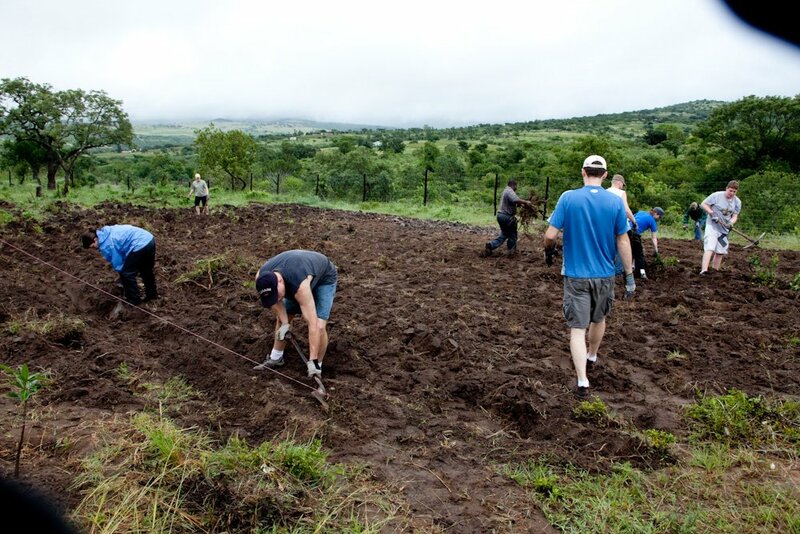 Enaleni now has water, a fence, a latrine, a garden, and an orchard. Bhobhokazi has a kitchen that was just finished. That’s it. But the inspiring thing is that Bhobhokazi is what Enaleni was just one year ago. I almost felt like an intruder as I watched one of the little girls from Bhobhokazi receive her care package. It was such a unique moment. The rain was absolutely pouring and half our team was crammed into the porch area of the half-finished kitchen building donated by another compassionate church. The few children that had been drawn to the care point by the arrival of the “white people” were lined up in the future kitchen area waiting to receive their packages. I was stuck in the back of our group, trying to catch even a small glimpse of the process. Suddenly, I caught a lucky break; the stars (and bodies) aligned and I had a clear view of the doorway just as one little girl received her package. I could almost read the thoughts racing through her mind. First, she just looked at the package as if she didn’t know what to do with it. Then, time seemed to slow as I watched the realization that this gift really was all for her spread across her face and into her eyes. Wow! Her eyes said more than words ever could; there was no such thing as a language barrier. A beautiful mixture of delight and thankfulness was completely held in her beautiful brown eyes. I could have looked at her forever, but the gap closed and the moment ended. It was, however, a perfect moment to (almost) close my time in Swaziland. ast blog entry until we hit Amsterdam since we leave Swaziland tomorrow (after saying our goodbyes at Enaleni) to head out to Kruger National Park in South Africa and we’re not sure whether or not we’ll have internet access at the guest house there. Thanks for following us this far and keep your contest entries and other comments coming! 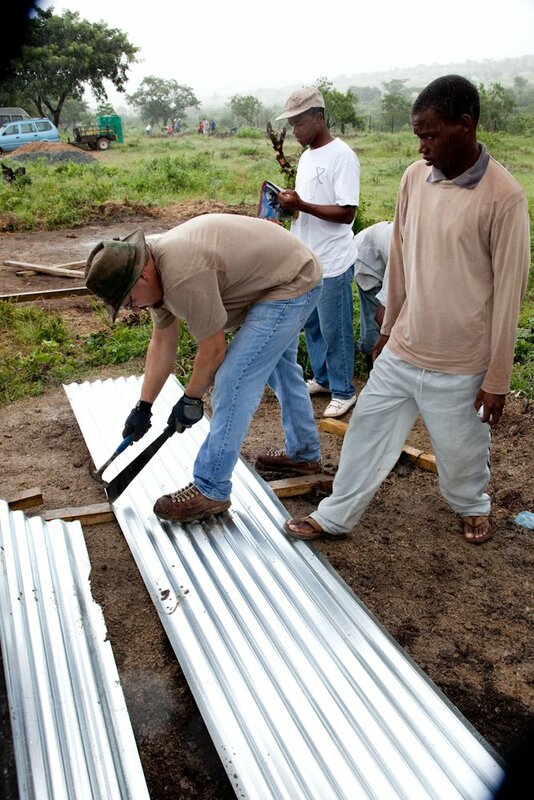 How to cut sheet metal…Swazi style! Thanks team so much for your blessing to us back home. You carried/were extensions of our hands, love, hugs, joy, playfighting, giving, and hard work. 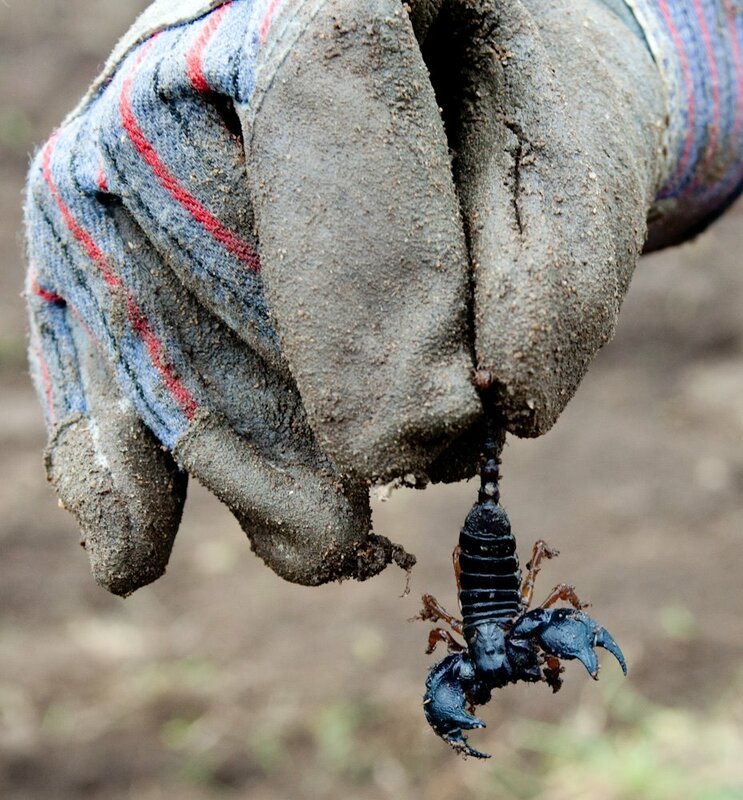 It has been an incredible journey to follow.as for the scorpion contest, we say it was definately Doug’s hand, Rena says “them be guitar playing hands”… or something.Anyway, we pray that the rest of your journey continues to be life giving, and perhaps a little less rain-filled. You have been a huge blessing to so many, now allow to God to warm your hearts with the memories of what has happened this past week. Rest in the knowledge of the love He’s poured out through you. More has yet to be done, but you’ve done amazing things.Enjoy the safari, you deserve it. Safe and comfy travels.love Rod and Renap.s. another name to be considered in the name that Elephant contest – Kú-níka. It means to give. Simplistic as it sounds, as God has given, so have you, representatives of God and Riverwood. And this giving will continue as these kids hearts will only reflect the generousity shown to them. What a challenging day as you finish up your projects for now at Enaleni and what a challenge you found for us at Bhobhokazi. I can only imagine how difficult it will be to say good bye when there is still such great need but I am confident that it is not “good bye” from Riverwood only rather, “until the next time”. After all, you have made the world a much smaller place for all of us on both sides of it. Well done! Have a safe flight back; enjoy the safari and the rest you certainly need. My vote is Doug is holding the scorpion. Wow guys, it has be so wonderful to follow along with your experiences these past days. Our God is so good – he is doing amazing things. And you have been so faithful and obedient in serving him!! Way to go!! “When we see the face of God we shall know that we have always known it. He has been a party to, has made, sustained and moved moment by moment within, all our earthly experiences of innocent love.” C.S. Lewisp.s. I think the hand holding the scorpion was Nick’s. p.p.s. I miss you guys! Get home quick! !